Machine washable on cold water gentle cycle, Made of 100% Polyester. Add a pop of color with this Pretty Trulip Easter & Spring table runner. Intricate embroidered Butterflies, Tulips and Daisies in Orange, light Pink, Yellow, Brown, hot Pink & Green make a colorful design. Cutwork borders with embroidery highlights complete the piece. 100% Polyester Machine Wash & Dry Low 69" L x 13" W.
Norwegian Folk Art Rosemaling Table Runners - Polyester 11"x35"
The Table Runners are in Like New Condition. I have included a pic that shows them on a farm table that is 8’ long, as well as a dining room table that is just over 6’ in length. The Table Runners are not white, but more of an ecru/cream/off-white color. Trending at $24.68eBay determines this price through a machine learned model of the product's sale prices within the last 90 days. Perfect for Fiesta or Cinco de Mayo celebration. The handmade table runner have fringes at the ends to add a bohemian look to them. You will wow your guests with this simple addition to your table decor! 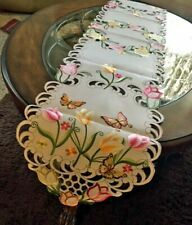 Colorful Embroidered Butterfly Easter & Spring Decor Table Runner 68"x 13"
Table Runner Dresser Scarf. 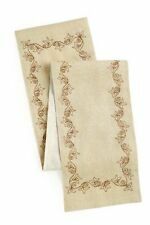 The Beautiful crisp & fresh Table Runner has a bright White background and embroidered with fluttering Butterflies. Creative White embroidery is shadow highlighted in the background under the colorful design. Featuring burgundy plaid checkered borders framing two 5-point star on navy plaid. Arlington Quilted Table Runner 36". 1 Table Runner (13" x 36"). 100% Cotton machine washable. 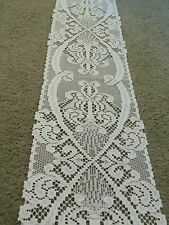 LACE TABLE RUNNER. BEAUTIFUL FLORAL DESIGN THROUGHOUT. 60% POLYESTER - 40% NYLON. GOLD IN COLOR. SPOT CLEAN ONLY. Handmade Spring Table Runner 40"X14"
Country/Primitive/Farmhouse/Quilted-Country Tapestry-Table Runner-36 1/2" x 13"
1 X Burlap Natural Cotton Fringed Runner 13x36"
Burlap Black Check Table Runner Fringed 13x36"
Table runners made of sumptuous fabrics can add a touch of elegance to a table. On the other hand, they can enliven an informal dinner party with a fun motif or a holiday dinner with patterns of holly or Easter lilies. 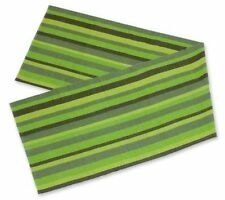 With the vast variety of options to choose from, there is a table runner for any type of dinner party or event. What are table runners made of? Table runners are long, narrow pieces of fabric that run down the center of the table from one end to the other. You can also use two on either side. A runner can just overhang the ends or can hang down nearly to the floor. Table runners are made out of a great variety of materials. They include lace, silk, velvet, satin, cotton, and linen. They can be woven to look like medieval tapestries or Mexican serapes, be made of scraps of fabric for a quilted look, or made of braided jute. Some are made of burlap or burlap edged with lace or ribbon, and some are fringed or have tassels at their ends. They can be embroidered or embellished with sequins or beads. They can be reversible and have patterns of plaid, gingham, leaves, flowers, and paisley. How do you take care of a runner? Blot up spills right away. With most fabrics, rinse what is left of the spill with lukewarm water and a mild detergent. Wash the runner immediately after it is used, even if you intend to keep it on the table as a decoration. Use warm or even cold water and oxygen-based bleach. If there is a care label, follow the instructions. Do not use fabric softeners, for these can weaken the weave of the fabric. How do you store runners? When they are not being used, the proper way to store them is to iron them, if they can be ironed, and then roll them up. You can do this with a mailing tube or even an old paper towel tube. 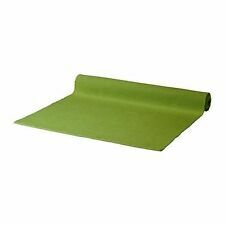 Roll a few sheets of acid-free tissue paper over the roll, then roll the runner over it, and cover it with more acid-free paper. Store it horizontally in the linen closet. You can also hang it from a padded clothes hanger. Put some tissue paper between the hanger and the runner first.